Supermicro has crammed 1PB of Intel flash rulers into the slimmest possible 1U rack storage server. The two-socket server can hold up to 32 Intel EDSFF, NVMe-connected flash drives – giving a rack density of 1PB/U, the highest we have ever come across. EDSFF stands for Chipzilla's Enterprise and Datacenter Storage Form Factor, which measures 325.35mm long, 9.5mm wide and 38.6mm high. These front-mounted SSD DC P4500 Series drives are hot-swappable and each has a 32TB capacity, using 64-layer TLC (3bits/cell) 3D NAND. An Intel tech brief (PDF) provides the details. We're told the drives are thermally optimised to require less airflow than a 2.5-inch U.2 SSD. The performance numbers are heroic. Supermicro president and CEO Charles Liang said the product provides "13 million IOPS and 52GB/sec throughput in 1U" and claimed it outperforms any previous system available. The kit comes either as a storage server or just a box of flash (JBOF). Up to eight hosts can be directly connected to the 1U storage server with pooled NVMe storage. But if NVMe over Fabrics Ethernet connectivity is used instead, unspecified hundreds of hosts can be connected. Suggested application areas are, unsurprisingly, big data analytics, with real-time financial fraud detection as an example, media storage and video streaming, and content delivery networks. This kind of storage density will take some getting used to by system designers, not least concerning the blast radius if outages occur, and the data protection burden. Supermicro's chassis also supports standard U.2 SSDs. The SSG-136R-NR32JBF JBOF comes standard with redundant hot-swap cooling fans and power supplies along with tool-less drive trays for increased serviceability. 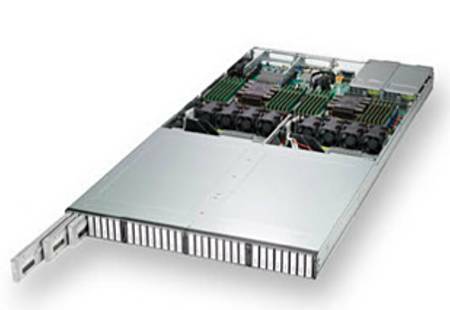 Supermicro announced a 288TB 1U storage server in January using 8TB Samsung ruler SSDs. A 256TB version using previous 8TB Intel ruler SSDs was introduced in May. That has been well and truly exceeded with these 32TB drives. Looking at this Samsung and Intel ruler data suggested to us a 64-layer Samsung flash ruler could exceed 32TB in capacity. And, we hasten to add, 96-layer flash is being developed, along with 4bits/cell QLC technology. That means we can realistically have an expectation of 64TB EDSFF drives in the 2019/2020 timeframe, meaning a 2PB/1U Supermicro product could emerge. El Reg would like to gently encourage the flash media and SSD industry to settle on a standard ruler format, ending the Samsung-Intel format dispute, so that customers, both OEMs and end-users, can avoid drive supplier lock-in and we can all benefit from competitive developments within a standard format.